Ho Ho Ho! It’s December, and Christmas is in full swing! Christmas was actually in full swing from about the end of October, with shops and supermarkets moving seamlessly from Halloween. Decorations appeared in Canary Wharf on about the 9th of November, and it has basically been downhill ever since. Now I’m not a modern day Scrooge, but neither am I a particular fan of Christmas, and certainly not a Christmas that lasts for two months. A week, I think, is fair enough. Long enough to get into the swing of it, short enough that the end is always in sight, which is always important where large family gatherings are concerned. If it were up to me, Christmas would start on the 23rd, and all evidence of it would have gone by the New Year, and I think I’m being pretty generous there. An argument could easily be made for a day either side of the actual day and have done with it. However I’m not in charge, and so it is seemingly endless. Christmas Carols have started in Chateau L already, sung at high pitch by small girls, and frequently before 8am. Needless to say this is insufferable, but there appears nothing I can do to avoid it. Entreaties to stop are met with whispered conversations with Mrs L, giggles, and even more happy singing. And herein lies the problem: Mrs L is a big fan of Christmas. Not in the sense of smothering the house in lights, an inflatable Reindeer on the roof and sticking a “Santa please stop here!” sign in the front garden, but of just generally being deliriously happy that it is on the way, stocking up on wrapping paper, cooking stuff, encouraging offspring, and playing Christmas music late November. This is typically restricted to her car in the early stages, but by mid December it has made its way indoors and permeates everywhere. I cannot even escape it at work. Whilst there are no Carols, various employees seem to delight in competing with each other to see which area can decorate their desks in the most outrageously lurid manner. Obviously I do not get involved, but as we sit in little cubicle-like things we share adjoining walls, and mine are now covered in green and gold tinsel. It would seem churlish to push it back over the edge, so I tolerate it. But there are some elements of office Christmas that are simply intolerable. Of all the irritations that Christmas brings, office Secret Santa is amongst the very worst. An email recently came round offering this delight, complete with voting buttons. Naturally I voted no. My team however are very aware of my dislike of this time of year, and knowing how I would vote somehow knobbled the system and had my name put down anyway. Thinking I was safe I was aghast to receive a name out of a metaphorical hat (the internet does all of this now, hats not required) along with instructions on how to wrap it anonymously etc etc. Maximum gift value ten pounds. TEN POUNDS!!?? So now what? In this era of smartphones video and photographic evidence would be obtained and circulated widely to colleagues in other offices. 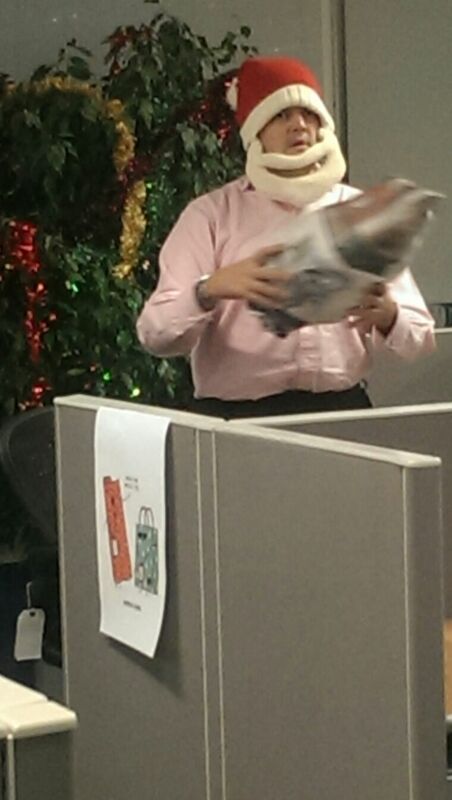 Company printers would likely be abused and colour A3s of me being Santa would appear. On the other hand to throw the hat on the ground and swear copiously in front of twenty-five people would not be very graceful. Or managerial. So to raise team spirits and promote togetherness I was Father Christmas for five minutes. Ho ho bloody ho. Anyway, hopefully it was worth it and people now feel like Christmas has started. Also note that comments about my perfect physique for this role did not go unnoticed, and when annual reviews take place later this month a number of people should expect very poor appraisals indeed!